The sons of Genghis Khan were waiting for wolves. It was a bright November morning, and the mercury hung at 10 degrees below zero. A new dusting of snow covered the steppe, and tire tracks led to the top of the bluff where the Chief had parked his Range Rover. The Chief was a large man and the thermal parka he wore added to his girth, making it look almost as if he had been stuffed into the driver's seat. The motor of the jeep was at idle, and the cabin heater was blowing full blast. The Chief cracked the side window to better accommodate the barrel of his gun, the double trigger rifle with the shiny telescopic sight, that lay across his lap. Then he uncased a new pair of binoculars and began to scan the whitened hillside in the distance. A couple of miles away, on the farside of the valley, eight horsemen sat astride their wooden saddles, waiting patiently. Their job was to flush the prey in the direction of the Chief and the three others would be hunters in the jeep. They were sheepherders, nomads, and this was the valley they had chosen for winter grazing. Two of the men had worked for the Chief, raising livestock for his export companies in the city. The Chief was rich, and the other riders knew him by reputation. The Chief in turn had heard of one of them, the man called Hunter, a short, sinewy Mongol with an easy smile. The day before, the Chief had passed his yurt, where he had seen a fullsize wolfskin flapping in the breeze like a frozen piece of cardboard. 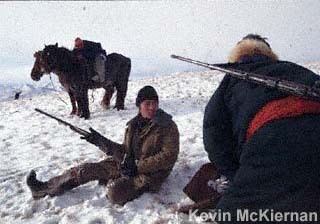 Hunter was 50 years old, and he had shot some 30 wolves since his 16th birthday, "not counting little wolves". As the Chief saw it, Hunter had a way with luck. That was just what they needed on this trip.